Rise and shine! It’s time for more Previews! Just like with Ordeal of Purphoros, the enchanted creature grows when i attacks then at a three counters you must cash it in for your reward. Drawing two cards after laying the beatdown with what will usually be a creature with evasion is not too bad of a deal. It will also sometimes cause a Heroic ability to trigger if you can target something you foresee attacking that many times without dying in combat. That’s half your starting life total! This little Aura gives us a big boost in our life total. We can be racing with a little evasive creature or a stronger hexproof one, knowing we can catch up by gaining a whopping 10 life ! I guess this is represented on the card by the ‘Hero’ eating a ton of Minotaur meat or bringing it back to his village for a victory feast. Maybe has a Corpse Hauler with him to help carry the body, that guy looks like he can carry a LOT of corpses. Lookout for the sneaky Cyclops! The black ordeal is the antithesis of the blue one. You get to Mind Rot your opponent. I can see people trying it in more casual decks with a creature like Hypnotic Specter to get the most bang for their buck. You have the flying ability of Hypnotic Specter and its built-in discard ability. In fact, if all goes according to plan you will have had your opponent discard 8 cards and take 12 damage after sacrificing the Ordeal of Erebos. You will also be left with a 5/5 Hypnotic Specter and that’s nothing to sneeze at either. Once you vanquish your fearsome foe you get the search for a couple of basics. Yeah, I suppose it’s allright. It can somewhat legitimately be played on a turn 1 Gladecover Scout and allow you to ramp three turns later. Your little hexproof guy gets bigger and they have to kind of keep up. Nothing’s stopping you from piling on the Auras, he is Hexproof after all. You might want to stop once you get the hint that a Supreme Verdict is coming though. A cute little one mana counter with a slight drawback. Basically a Negate/Annul hybrid (yes, minus the artifact clause). It’s going to see some play (the Gods are enchantments after all, right?). It can protect your instants (Sphinx’s Revelation) by countering their counters. Seems like a good time to play Counterflux? In dire times, you can even counter your own instant if you desperately need to ‘Flash in’ a blocker or creature at en of turn. Jam some into your Green sealed or draft deck and dominate. You can’t help but notice the wacky art on this. It’s well drawn, but just odd. It actually seems like an older version of Sphinx of Lost Truths. It’s like he just got older and his hair grew – a lot. Ability-wise, Prognostic Sphinx gives us some interesting options. The ability to give it hexproof is nice, but you have to tap it. This means our opponent can still toss a removal at it to let some of his attackers through before we get to declare blockers. Still, it’s somewhat ‘free’ (depending on what we’re tossing to give him Hexproof). The other ability is pretty cool. He get to somewhat ‘Sensei’s divining top‘ while attacking. It’s obviously better than the 1 mana activation of Sensei’s Divining Top since we get to put whatever we don’t like at the bottom of our deck. The 3/5 body is somewhat fair for the cost (again same size and cost as Sphinx of Lost Truths). I am still unsure how much play, if any, this particular sphinx will see in the next Standard environment. I just really want to try him in some kind of deck even if it has to come down to finding a slot for him in my Commander deck. I’ll try to avoid the whole history lesson on 2/1 creature for 1 white mana (usually referred to as Savannah Lions). For s single white mana we get a very relevant creature here. He can attack past things like Deathrite Shaman (not sure who would need to block with that, but still) and Boros Reckoners. Add in another Soldier of the Pantheon and they can take down the dread Boros Reckoners unscathed, though your life total might suffer a little. If you’re not old enough to remember Savannha Lions, we can also call him Elite Vanguard. By virtue of being a rare isntead of an uncommon, Soldier of the Pantheon gets those extra perks for free (unfair, I know). You can be pretty sure he will be a four-of in any Boros or White Weenie deck that will come to be. If you plan on playing either of those archetypes you might want to pick up your playset early. We get our white Emissary which is just another decent ‘Hill Giant‘ with an ability and super expensive Bestow cost. Nothing particularly exciting, but you’ll need these in limited if you plan on going white no doubt. It would be simply mind-blowing if this were to somehow find its way to the promised land of the 60-card decks. What’s the nickname for 1/2’s for 1 white mana? Not quite the White Weenie powerhouse that Soldier of the Pantheon is eh? I’m not even sure he’s worth triggering Heroic on, since the payout is so-so. Sure, you can probably get s decent-ish trade in here and there with bigger creature. I guess I would consider giving it the +3/+0 half of Martial Glory in order to take out a 5 or less toughness creature though. I can’t even count the number of times I had to suggest to newer and not-so new players to take Cancel out of their decks and play Dissipate, which is strictly better. Dissipate is going away with the rest of the Innistrad block and this is probably its replacement. You will probably really appreciate the Scry 1 ability on this card a lot. I know that in games that went long where I was holding a land and a counter (say Syncopate), I would get incresingly frustrated when countering a key spell and have my reward be yet another land off the top of my deck. This card can minimize these kinds of scenarios, but not by a huge margin. Still, you have Scry 1 lands this set as well that allow you to get some card-quality late game. The artwork is pretty easy on the eyes too. I can see it as a 1-2 of in decks that can’t simply play Counterflux instead. Lifelink moving more and more to black? Sweet! I guess it was worth the wait for most people who were eagerly anticipating this nice legendary permanent. You get a slow Sorcery speed reanimation spell that’s reusable (reduce, reuse and recycle). Your huge or medium-sized reanimated creature will swing at your opponent and gain you some life. I’m not 100% sure if this will be the best one competitvely, since Hammer of Purphoros probably holds that title. However, this is my personal favorite amongst the five. It ‘curves’ nicely after a turn 3 Dark Prophecy or Underworld Connections and allows you to recoup a lot of lost life (either from taking damage or drawing cards). Yes yes, you have to have some creatures in there somewhere but we’ll wait to see the rest of the set to figure out which ones make the cut. Of course there’s always Erebos himself. The monoblack deck seems somewaht pre-built for us this set, but as we all know its a recurring pattern. It seems like a great deck and then you try to build it. Things start competing for the 3-4 mana slots and eventually fall apart. It’s funny as it’s quite fitting: Black is the color of despair after all right? (hence why it did not get a Miracle card in Avacyn Restored). Good ones drops in Black are always hard to find. They are usually Zombies and have drawbacks. Tormented Hero is no exception here, but he actually has a potential upside as well. The Heroic ability seems a little underwhelming here but can make the difference if you can enchant him as of turn 2 and start attacking. It’s obviously the point. Which leads to the question: just how fast is the ‘Speed of Stupid’? Aside from that seemigly useless anecdote, this card is somewhat hard to gauge. The damage is deal to opponents only so you can’t compare it to say, Flametongue Kavu. By default it usually gets to deal at least 1 damage, hardly anything to get excited about. It’s 4/2 body for 4 mana is not particularly exciting. He does however belong to one of Theros‘ tribes: Minotaurs. If we can managed to chain together our Minotaurs properly, we will get to deal 3 damage when Fanatic of Mogis ‘enters the battlefield’. For now it’s either Fanatic of Mogis or Canyon Minotaur. Tough choice, huh? Someone out there is going to try and break it as with most of the new Theros cards. Only time will tell if this card will live up to its ‘Power 9’ ability. What do you guys think? Yay or nay? Steam Augury seems to be the ‘fixed’ version of Fact or Fiction from Invasion. A card which was featured recently in From the Vault: Twenty. It also was a rather expensive FNM promo back in the day and even had a makeover with Jace in the alternate card art. It basically allowed you to get your best card amongst the top five residing in the top of your deck. Sometimes you would even get a little bonus, like a land. Other time your opponent feared one card so much that he would make a pile with just that card and a pile with the four others. The roles have now changed. You are probably getting the small pile or less useful one. Probably a couple of lands and less relevant spell. Still, you get some cards and that’s always good. It’s still better than Thoughtflare, or is it? I’m pretty sure that R&D knows what they’re doing and this card is not going to be that awesome. That being said, it’s still going to see some play. Decks that don’t already run the awesomeness that is Sphinx’s Revelation will probably run this or Opportunity for some card draw. I’m fairly sure a lot of players that were trying to get Grixis decks to work are rejoicing right now. Nicely done Wizards of the Coast ! Essentially the fabled Trojan Horse of Greek Mythology (and not the computer virus), it goes to your opponent and allows you to slowly make tokens. The Greeks used it to invade Troy in and the soldiers came out of the giant wooden horse one by one at night and invaded the city. Similarly, you are giving your opponent a creature that he cannot do much with, save block. Over a few turns you get token after token and slowly outnumber him. Not the best card of the bunch, but it’s funny in Zedruu Commander decks and it’s just a cool card overall. I wouldn’t be overly dissappointed to open one of these in a Theros Pre-release either. We’re more than halfway there ! Thanks for liking us on Facebook. We would also appreciate some sharing as well. We’ll be back very soon with many more updates. Cheers! See a card you would like to get your hands on? Check out our Theros Preorders page. As you can see, it is not so unreasonable for this card to exist. What does this mean for Dreadbore? Well, it means that if your deck is still a Red/Black aggro deck that is tight on mana – you might not make the switch from Dreadbore to Hero’s Downfall. If you are a monoblack or slower Jund deck, you should probably consider adding this card somewhere in your 75. I’m not going to jump ahead and suggest you put this in all your black-based decks just yet. We haven’t seen the whole set, plus there’s always Pithing Needle if planeswalkers ruin your day. I expect this will be very sought after around Pre-release time and I’m not sure if it’s going to maintain its original hyped value or not. Most cards usually don’t, but there are quite a few that live up to the hype. Your best bet is to get your playset first and then focus on trading the extras for whatever else you really need to complete sets/decks. At first glance, this card is a quality piece of cardboard. Then you start to wonder what you can fit this into and things start to fall apart. It’s got quite a few of the same problems as Blood Baron of Vizkopa. In a vacuum, the card seems legit. Good abilities, cost and size. The mana costs are not too restrictive and the dollar value seems fair. That’s just it though: the card is just fair. It doesn’t straight up win you the game or at least turn the tide that much (like a Sphinx’s Revelation, Thragtusk, Olivia Voldaren, etc). Granted the aforementioned cards are a little hard to top, but this card doesn’t even seem to come close. It has 3 abilities, isn’t it like a Golgari Morphling? Actually, that title belongs to Deathrite Shaman. 3 very relevant abilities all at a very cheap cost. Reaper of the Wilds doesn’t compare. It ‘dodges’ removal if you keep 1G up. How often is that going to happen in a Standard game? Not too often, at least not as of turn 5. Also, casting the card on turn 4, without acceleration means that you are basically casting a 4/5 for 4 mana more or less vanilla creature. Keeping one black mana up is fine if your opponent cast a bigger dude and you can hope to trade. With a lot of the Gods being indestructible, deattouch seems less powerful. The second ability still allows you to not walk into an Azorius Charm, Detention Sphere etc. Its Scry ability might be the best one overall, allowing you to trade in your dead creatures (and your opponent’s) for some free peeks at your topdeck. Its body is just big enough for it to have survived a ‘Mutilate for 4′, if Mutilate were reprinted or didn’t rotate from Standard. This card is very particular: you get the usual ‘Cranial Extration/ Appetite for Brains‘ effect of exiling the card in their hand. However, you get to cast the card but need to pay the mana cost. This is much better than you think. You see: if you take a Sphinx’s Revelation and were able to cast it without paying its mana cost – X would be 0. By forcing you to pay the mana cost, Psychic Intrusion becomes less cute and more potent. It’s not limited to Sphinx’s Revelation’s X cost either. Last time I checked Rakdos’s Return was still a viable card. All that being said, it still probably belongs in most Dimir-based decks sideboards. Exile an Atherling and save it for much later so you can win the game with it. Or get rid of a juicy counterspell and use it on a late game threat when it counts. Your opponent knows its coming, sure, but what can they do to stop it? Counter the spell? that’s pretty much about it. It’s not like they can do much to a card that’s been exiled, so you will probably always get to at least cast the card (because you can use your mana as any color mana to cast the card). It’s going to be a fringe card, but one that is potent in commander as well. Since as with Daxos, I’m pretty sure it bypasses the whole color-identity clause when you produce mana. It doesn’t really take a genius to notice that Ashen Rider is going to be bonkers is some kind of reanimator deck. What’s more is that you get value out of either end of a card like Rescue from the Underworld. Ready your Scavenging Oozes because you’ll probably need them. If you’re a fan of Commander, you now have your Angel of Despair # 2. More nice black/white destruction cards to join your army (which probably also contains Merciless Eviction). The Archon creature type is a pretty odd one that they haven’t given the tribal treatment yet and I doubt that will come anytime soon, still never say never,eh? On another random note, it pretty much helps you fullfill half the devotion requirement on either both Erebos or Heliod. Is this the Rancor you’re looking for? We now get a nice replacement for our Wolfir Avenger or Rancor. While you can’t compare directly to either, there are similarities. The obvious trade-off on Wolfir Avenger is 1 more power instead of the ability to regenerate. Worth it? Too early to tell, but probably not, unless you are basically using it as ‘removal’. I’m also not sure how relevant the Satyr creature type will be in the set. As for the comparison to Rancor, it was basically because you get some value either way and it’s one of the ‘lower’ Bestow costs so far. It can trigger Heroic in a ‘Flash’ . It’s low-risk as Rancor was, even versus decks packing quite a few removal cards. It can also allow you to animate Nylea out of nowhere, thus gaining two surprise blockers (something you can’t do with a ‘surprise’ Advent of the Wurm). The card is also a Rare as opposed to Rancor and Wolfir Avenger‘s Uncommon rarity, so it’s probably going to be worth a considerable amount as well if it ever gets popular. non-Gorgon? That’s like 99% of Magic: the Gathering creatures! You can also just play all 4 of these lovely ladies in a BUG Gorgon-based Commander deck. Might as well try to be different and go for a more flavourful approach when playing a casual format. In Standard, who knows? She might be your deck’s ‘End Boss’ in the very late game, allowing you to kill numerous opposing creatures and offing your opponent in a couple of fell swoops. I wouldn’t bet on it though. We’ll close out today’s Wave with this little gem. It’s a strict upgrade to Glorious Anthem aside from the fact that you can’t really stack them since it’s a Legendary card. The activated ability on it is a nice bit of removal, destroying creatures that ping your life total on top of those that simply deal you combat damage. Unfortunately, this still does nothing versus Deathrite Shaman (it’s just too good to keep down). This card might usher in another era of White Weenie or Boros aggro decks, either of which we’ve seen a lot of lately. Sure, there’s always the odd guy playing the WW/r Craig Wescoe deck from Worlds. That’s still something we don’t see often these days. It’s poised to make some kind of comeback with the Heroic abilities as well as the Boros guild’s Battalion mechanic. Spear of Heliod is probably a bit slow, but in White Weenie decks it’s not uncommon to have nothing to do with excess mana mid to late game. This thing says: ” I dare you to attack” to their best offensive creature. If the bluff is called, the same will be then said to their second best offensive creature the following turn. Fear the Spear! (Unless you’re a God, of course). You guessed it! More Previews to come tomorrow. Leave some comment and come back tomorrow for more. See something you like this Preview Wave? Go ahead and Pre-order it! A slight upgrade to Gates or a legitimate contender? Not impressed? I don’t imagine that a lot of players are. However, the Standard format is probably going to slow down and these will find their place in numerous decks. While the upside seems quite minor, the lands will prove pretty useful. Dropping them as of turn one provides a nice ‘mini- Ponder’ effect and allows us to set up our following play. By now means should you keep a hand that is light on mana and rely on a couple of Scry triggers to dig for the next land drops. The real use of this ability lies in the ability to not get more flooded in the mid to late game, especially for the more aggressive decks. You don’t want to be recovering from some mass removal only to draw a bunch of lands. It’s a good thing that Miracles are gone because even with just the ability to Scry 1 you could setup a timely Miracle and play accordingly since you know it’s your next topdeck. These will also be a nice addition to more casual formats like Commander, where you don’t absolutely need all your lands to come into play untapped and get a small peak before you end up playing your Sensei’s Divining Top (so that you can get many many peeks at your topdeck). Let’s face it: we were spoiled with Duals upon Return to Ravnica’s release. Did anyone really think it was going to get better? Exacly. Maybe we’ll eventually get something like enemy-colored manlands in the next block, but until then we have these Scry lands. Eventually though, they will all probably come to be know as ‘the Temples’ and perhaps that Scry 1 ability will be deemed powerful enough that even monocolored decks will play a few. Heoirc Merfolk? What will they think of next? Before you all go around speculating if this will find its way to a Legacy or Modern Merfolk list, let me settle that argument: NO! You have only 4-8 instants/sorceries that can target this guy in those decks and you get Silvergill Adept to draw cards. Triton Fortune Teller may see play in an American Aggro list with Battlewise Hoplite and Akroan Crusader. Martial Glory is still looking like the top contender to get multiple Heroic triggers. I might try to put together some kind of list for it once the set is mostly spoiled in order to be sure to have close to an ‘optimal build’. I guess the Zombies in Theros are going to basically be ‘Immortals’ look-alikes similar to the ones we saw in the movie 300. A nice 2/2 for 2 Rakdos-colored mana with 2 abilities that make it easy to trigger Morbid. Oops! that won’t be an option once Innistrad rotates, but for those of you that play kitchen table magic it might be. The main strategy behind this card lies in our ability to produce tokens, something I have alluded to quite a bit with the repeated mention of a 5-color tokens deck. While that ‘deck’ may never come to fruition, we need to keep an eye out for cards that could have good synergy with our legendary Zombie friend here. It’s interesting to note that you can sacrifice on Tymaret in response to a removal spell in order to get another copy from our graveyard to our hand. He’s going to be a hard zombie to Chain or Detain. Will we be seeing another Red/Black Zombies list once Theros is released? I’m betting that if will feel very much different than the RB Zombies list we have become accustomed to. Erebos, God of the Dead has a very very impressive static ability. While we may not relive the atrocities of repeated Thragtusk triggers, there’s bound to be some lifegain in the format. The ability is much better than Everlasting Torment ever was as it allows us to gain life, just not our opponents. We also get a nice 5/7 body if we manage to get our Devotion to Black >=5 going. Greed is a card I often is in a lot of monoblack Commander decks alongside cards like Phyrexian Arena. Drawing cards wins games, drawing more cards increases the odds to win games. If we can pair the two in Commander, why then not play a deck with Eberos and Underworld Connections ? You get to draw more cards and contribute more towards the Devotion requirement. Maybe go full Monoblack nuts and throw in some Dark Prophecy ? Why not give it a shot while the format’s in its infancy and catch a lot of opponents off guard? Wizards of the Coast’s not so subtle way of telling us that MonoBlack is back? For real this time? Nothing is preventing us from supplementing our deck with some lifegain to get to use Eberos’s ‘Greed’ ability more than a few times. After all, we’ll probably end up being a control deck. Control decks love lifegain and card draw, don’t they? I’m not sure if straight monoblack is going to suffice for the lifegain part, Gray Merchant of Asphodel can’t do all the job by himself can he? We hope you enjoy these little Previews as much as we enjoy writing them. Give us some feedback on our Facebook page, Twitter or just reply to the articles here. Get your Pre-Orders in before we run out! We now have a third planeswalker in the set! You heard right: three planeswalkers so far in Theros. One of the rarer +2 loyalty planeswalkers, Ashiok’s + ability is rather unimpressive. Clearly it builds up to something. If you take it at face value, you’re basically activating a Nephalia Drownyard each turn. Meh! I supposed with enough protection he can be a win condition just based on that. You save 4 mana a turn when compared to Nephalia Drownyard. Mana that can be used to do cool stuff like play cards such as Far/Away. Yay! Free Ornithopters and Dryad Arbors! Or you can just grab a 4 cost creature after you’ve +2 ‘ed your opponent once. In a sense he can probably ‘protect’ himself. It’s a funny way of looking at it, but it is more or less luck-based and limited to what you have exile with Ashiok. Better practice your milling skills boys! In order to prevent any kind of abuse, Ashiok’s + ability is limited to your opponent’s library. I haven’t really fathomed all the stupid stuff you can do if you were allowed to target your deck, but there are quite a few. You also probably won’t be using the second ability on Ashiok, Nightmare Weaver often if your opponent is playing a control deck that runs little to no creatures. No idea how many of those are going to be floating around, but there sure are a heck of a lot of ‘Superfriends’ aka. planeswalker options. Um, not quite a Jace, the Mindsculptor ultimate eh? So how do you win with this again? Exactly. It’s somewhat cryptic. Does it fit in a ‘Turbo Fog’ style deck? Not quite sure. Still, you get to do a Wit’s End, which can’t be all too bad. I imagine that against control decks you can get him to 11 loyalty, use his ultimate and then continue grinding his library away. So on the fourth activation gets you one ultimate, then every 6th activation gets to be an ultimate (if you wish). You get to blank his has of counters, dead cards and whatever other nasty comeback cards he may be holding. Also, these cards are gone for good off to join their other exiled friends in From the Vault: Exiled. Yes, it’s a bad removed from game joke. Speaking of Remove from Game, I want to take this moment to promote one of the coolest product I have seen as far as card protection goes. They don’t split when you shuffle them, nor do the corners break (because they’re rounded). The cards are a little tight to fit at first, but it gets easier after. I highly suggest you go purchase some and get back with your feedback so that people don’t think I’m shamelessly promoting weird card protectors. I’m not sure if they still sell them on their site, but I’m sure you can purchase them if you search hard enough. The somewhat unexpected ‘Searing Spear‘ reprint. It was looking like Magma Jet was taking over as the 2-cost burn spell and red decks were going to go for a more ‘Devotion’-based approach (with Boros Reckoners, Ash Zealot ,etc) to get Purphoros online as soon as possible. What is left to say about this card except that you will be seeing a lot for the next 2 years of Standard. If you want to pack it in Modern, knock yourself out. Between this, Incinerate, Searing Spear and Lightning Bolt – you can mix and match as you wish. Yep! every single one wrong. Still, the cycle of same-color hate was fairly evident and a really interesting twist on sideboarding. I am fairly certain they will all see a great deal of play with all the multicolored cards that the Return to Ravnica block brings to the table. Gainsay is going to be big versus Sphinx’s Revelation decks (of course) and winning counterspell wars. Other than that, It counters a few planeswalkers (even Ashiok) , Aetherling and some draw (Opportunity). Dark Betrayal is going to hit quite a few scary creatures for really cheap, so black creatures are ‘somewhat’ riskier. Doom Blade for non-black and Dark Betrayal for the rest (like Underworld Cerberus). Glare of Heresy is just wow! Any white permanent? Detention Sphere, Elspeth, Archangel of Thune? Nice sideboard card versus all the really annoying bomby white cards. Problem is how many can you fit in the sideboard? Also, how many is your opponent going to be siding in versus your white deck? Let’s not forget it also exiles Heliod. Finally, Peak Erruption is a little different from its other sideboard buddies. It can effectively Stone Rain your opponent’s land and potentitally set him back a color (lets not forget Ravnica block duals already). The 3 damage is very appealing, especially at times you can two-for-one their land and planeswalker. It can become increasingly good versus decks running Chained to the Rocks if you’re into getting full value. The Watchwolf comparison is rather unfair, because that’s what this card is in the worst case scenario. Once Monstrous, good luck doing anything to it. There are not many ‘edict’ (sacrifice a creature) effects left in Standard, save Devour flesh. Why is it that Cats are always better than Hounds in Magic: the Gathering ? Before you start thinking that it’s a shoe-in for some kind of Hexproof deck – don’t forget that most of that deck is rotating ( Geist of Saint Traft, Spectral Flight, Invisible Stalker). It might make it in some kind of Bant midrange deck since you can have it survive your own Supreme Verdicts. Either way, the way this set is looking Supreme Verdict is not going to be much of an answer to anything anymore. At the very least you have a rather hard to remove planeswalker protector. You can also make an opposing removal spell whiff since you can activate Monstrous at instant speed. Keep in mind that it can always be responded to, so try to activate it when your opponent is low on cards in hand or tapped out at the end of his turn. Black is not a color that comes to mind when thinking of minotaurs, we have been more accustomed to seeing them in Red and sometimes White. I guess those terrible Black Minotaurs in M14 were there to prepare us for the horrors to come. This Rakdos minotaur is very much superior to his M14 counterparts (not that it’s hard to beat). Essentially, he’s a 4/3 haster himself the turn he comes down. It’s too early to say if he makes the cute in a Standard Minotaur tribal deck, but I’m betting on ‘No’. If you ever wanted to try out the big creature Green deck or Green/White deck now is probably as good a time as any. This guy is very good for his mana cost. We know that being in the color of mana ramp you will have no problem casting him 1-2 turns ahead of time. Monstrous means beating your opponent down for 9 and potentially taking down some annoying flyer like Archangel of Thune or the Stormbreath Dragon. Having Reach even without being Mosntrous means you won’t see many opposing creatures swinging back at you with this guy in play. It’s a great piece of cardboard, one that will surely make more than a few people ‘green with envy’. I’m not entirely sure as to how effective this card will be in Standard what with it not having Flash itself. Still, there are some nice possibilities here. If you land it on your turn 5 with a tapped out opponent, you can simply Flash in a Prime Speaker Zegana (probably not the most efficient play) whenever to draw up some cards before it’s your turn again. You can also try for a Progenitor Mimic and copy a Prophet of Kruphix so that you can double up on the untap effect each time it’s your opponent’s untap step. Again, you can probably do a few nice tricks here and there but it’s all a matter of our dear Prophet staying alive long enough. Your patience and proper timing may very well be rewarded in the proper deck. Everyone and anyone playing some Simic or Bant Commander/EDH deck will be hunting down the foils, try to keep that in mind if you happen to open a shiny copy of this card. It’s a nice twist on last Standard format’s ‘enter the battlefield’ gimmick. Now you have to try to keep creatures and other permanents in play before you get to reap the rewards. I think it will make for a somewhat slower format and a much more enjoyable one at that. Still more to come ..
Keep checking back here to catch a glimpse of more Theros Preview cards. See you tomorrow! Back so soon? I figured you would be. After all, new Theros spoilers are being revealed daily and who doesn’t like some good news every day of the week? It’s like opening a little Christmas gift each day. This thing is pretty huge as far as new mythics go. It’s almost everything we had in Thundermaw Hellkite and then some. We get one less power but a very awesome protection ability. This is one dragon that will NOT be getting Chained to the Rocks. Protection from white means you will be dodging things like Detention Sphere, Azorius Charm and the odd Pacifism. It also mean attacking past things like Archangel of Thune. The Monstrous ability is not insane, but it does punish some more control decks that tend to keep a few cards in hand and grows this bad buy to a 7/7 as well. Not impressed? Then I don’t know what else to tell you. Oh wait! It’s also immune to Selesnya Charm, so you don’t have to fear making it Monstrous. What else … ? The card art is super sweet. You can also deal decent damage with it in a multiplayer Commander game. He’s a really great follow up to Purhphoros as he is bound to trigger the Devotion requirement and make him a creature. That’s a lot of damage in a small amount of time. Potentially 12 damage if it all goes unanswered. Or just a tame 6 if we deal the 2 damage from the Purphoros trigger ans only get to attack with our Stormbreath Dragon here. I’ll spare you any makeshift decklist this dragon will appear in as I’m sure it won’t be tough to pretty much auto-include him in a Red/Green or on the high end of a monored list. If Modern Merfolk ever topped their curve at 4, I’m sure this guy here is a shoe-in. With just a Lord of Atlantis in play you can have 3 2/1’s. Not impressed? Well, with a Grand Architect things can get rather disgusting (even without the Lord of Atlantis). You can just tap all your newly made elementals to cast a Wurmcoil Engine for starters. Not to mention that the tokens would now be 3/2’s. This is without having even cast anything on the 2 first turns of the game. Oh yeah, he’s also pro red. just in case a burn spell might have ruined your day. Of course if your opponent removes him with another color spell you’ll lose your elementals too. Truly tragic, I know. You can always just have some kind of team pump enchantment in play or something of the sort. It’s not too hard to get creative on that front plus the rest of the set might have a goody or two. Not the greatest of creatures or not the greatest aura? Which to choose? Beats me, but I’ll probably always sleeve this if my draft or sealed deck is packing some Plains. Not the game winning card you are looking for, but a solid team player. So many Nymphs, what is the Magic world coming to? With all these Nymphs flying around, I was going to make the apropos Nymph enthusiast or one who is crazy about Nymphs joke. You might even say they are maniacal. Nimbus Naiad gives us another bestow creaturs with which to complete our potentially 3-5 color Nymph deck in Pauper. Someone’s going to break it, I just know it! For some odd reason the Bestow on this one is higher. Whatever, we’ll be too busy beating down our opponents with our Nymph army to even care. If only they had like a queen of Nymphs and it made all their abilities apply to all Nymphs if they were in enchantment form (kind of like a weird Sliver effect). Also, anyone else think this is Wizards of the Coast‘s other ‘revamped’ mechanic that failed the first time (aka. Licids). We get the fourth Power Ranger here and she’s as expected. Nothing too great, but what did you really expect? You can’t have one outshining the others, can you? The cycle is almost complete. What? A Grizzly Bear that I can Naturalize? That’s terrible! Actually, on top of having the Nymph AND Dryad creature types, costing the least to Bestow and the least to cast – she can block flyers to boot. Yes, she is pretty much the best of the bunch. Now all they need to do is to actually make some kind of lord for them so we can all cry as we open what might have been a more enjoyable rare. Unless they make the Nymph Lord and Uncommon, then I’d be down for that. I don’t think anyone really expected another Red/Green planeswalker so soon. Let’s see: we had Sarkahn Vol first, then Domri Rade and now Xenagos. Wizards of the Coast realizes that there are 2 color combinations/guilds that have yet to even see one planeswalker, right? Even if he seems to mostly fit in a more mana ramp/creature swarm deck, I believe he’s basically just going to be sided into Red/Green decks for when they need more gas versus the most Control decks (probably Blue/White as usual). Xanagos allows those decks to recover very nicely from a Supreme Verdict. Pump out a 2/2 hasted Satyr and continue to apply pressure. So we get a nice little mana dorkish planeswalker ability. It can be pretty awesome or rather useless. Hopefully the next ability helps us in making it slightly better. Here we get the Red/Greem Haste-related ability. Very much appreciated. It gives us so much game against our opponents, it’s not even funny. However, it does not boost Xanagos’ loyalty. You can even take down opposing planeswalkers with your little Satyr army. He works pretty well with Return to Ravnica block’s battalion ability as well. That might still end up being a ‘thing’. Nice, not broken, but it’ll do. So in Commander you get to put some big nasty creatures (Eldrazi) in play and do wrong things. Yes, yes. A lot of other cards will allow us to do that anyhow. What’s great is that since technically the Gods count as creatures everywhere but the battlefield even when you don’t have devotion. Essentially you can still put all revealed God cards in play. Five color God tokens deck for the win! In a creature-based deck it’s hard for this ability to fail/whiff. As with Chandra, Pyromaster‘s ultimate, I don’t really see this being something the Red/Green decks will stive to do but as something that is a nice option if anything. The card is also drawn by Jason Chan (who also illustrated Jace, the Mind Sculptor). That probably means Wizards of the Coast is expecting really big things from this guy. Just putting it out there. That’s going to have to be it for today. Until tomorrow, may we see what other goodies will appear in what is looking to be a very epic Magic: the Gathering expansion. … And we’re back for another Wave of Spoilers! Battlewise Hoplite is sure to make it in any Azorius Aggro deck that sees the light of day once Theros becomes Standard-legal. The bonus you get is pretty huge in my opinion. Again, we just need to figure out what good spells, Bestow or otherwise, we will be incorporating into our decks in order to take advantage of his ability. I’m obviously a big fan of the artwork (I chose it as the article banner) representing a battle-ready ancient Greek soldier wielding a smidgeon of blue magic. The Scry is really nice on this sort of aggressive creature as it allows you to not draw ‘dead’ (aka. late game lands) later in the game. Of course this will required to use the Heroic ability moderately and with good judgment instead of going ‘all in’ just to get in one extra point of damage. Perhaps one of the most impressive Cyclops released so far (although I also like Nivix Cyclops). Even if he does not become Monstrous, he is going to be a pain to deal with. Protection from enchantments means he can’t be Detention Sphere‘d or whatever other anti-creature enchantment there is (Chained to the Rocks). Trample is always a problem for more controlling decks to deal with, hence the keyword ability you want most in a green creature. Once Monstrous, Polis Crusher can start taking down opposing enchantments. Break your allies out of Detention Spheres, Pacifisms, etc or destroy Underworld Connections, Sphere of Safety,etc. I’m not sure how Polis Crusher is an appropriate name, as ‘poli’s usually means city. He doesn’t destroy lands or artifacts, so the name is a little misleading. I know that’s probably irrelevant to most of you, but it bugs me just a wee bit. I love how no one seems to be employed in the Cyclops tribe. They are just Cyclopes, seemingly all equal. It would be nice to see a Cyclops Shaman or something. Just sayin’! We get a Rakdos powerhouse of a creature in a 6/6 for 5 mana with 3 abilities. What deck will this fit into? I’m guessing the next iteration of Jund will like it quite a bit. It has the blocking restrictions of Phyrexian Colossus (card that actually saw tournament play back in its day) without the doesn’t untap drawback. You also get a Ground Seal on legs in a totally different color. Finally, the third ability can be somewhat seen as a drawback. I’m not sure how much of a drawback it is when you’re trying to gauge if you should shove this into your constructed deck or not. Being Rakdos or even Jund colors usually means you are pretty high on low drop aggro creatures or a medium amount of ‘value’ creatures. It also doesn’t suffer from any random other drawback such as being legendary. Of course it had to be mythic so that its initial value gets somewhat inflated. Whether it will maintain any value/hype is hard to say. One thing is for sure: you’re going to need to find space for it if you’re running a Rakdos-colored EDH/Commander deck. I’m not grasping any obvious strategy for this cards, except that it can very well be a sort of anti-control card. Just tuck away a bunch of permanent that would ‘obviously’ otherwise be countered because we know that that’s all that Control decks do (*sarcasm*). When you have your 7 mana flow, you just open the floodgates and you clearly gain the advantage in permanents in play. This works becasue clearly your opponent will only have boring stuffs like Instants and Sorceries exiled. Yes, that was a silly way of explaining it but maybe there will be some cool Scry tech with it or something. It’s a shame they didn’t reprint Crystal Ball, eh? This is obviously less good but it fits in the flavor and stuff. It’s at its best in limited as most cards with the Scry ability are. Thematically it might even fit into a casual Bogbrew Witch deck since you can use her to fetch a Festering Newt and Scry with the Newt until you need to sacrifice it to the Cauldron and destroy some annoying creature. Not the most exciting of Legendary lands, but monocolored decks ( obviously) will probably run a copy if they need to ‘accelerate’. The term is used somewhat losely since you’re probably needing it to cast something at 7-8 mana to warrant its inclusion. Maybe with the new legend rules in place you can activate one and then play another to get an insane amount of mana. The art on this is really awesome and I for one would love to get a fooil one for any monocolor Commander deck I plan to build in the future. A slightly more playable Emissary than Thassa’s Emissary that we saw just prior. It’s ‘unblockability’ makes it somewhat of a consideration but not a definite inclusion in any deck. I’m pretty sure you just jam this into your sealed or draft deck if you’re even playing a small red splash though. It’s not the coolest card to end a Spoiler Wave with, but I’ll be posting more as they are revealed! 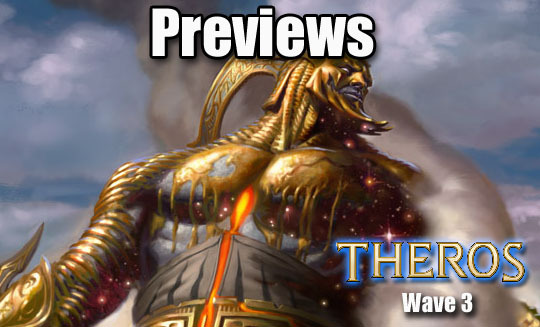 Don’t forget to check out our Theros Pre-Orders ! If there was ever a Scry card I loved, it’s definitely Magma Jet. I often pick it high enough in Cubes if I am splashing or maining Red in my deck. It is Shock + Scry and works relatively well. Zap one of their early drop and scry for either you 3-4th land or late game burn your opponent to the dome and dig for more gas. The only small drawback is that now you will probably need to run something like Flames of the Firebrand to hit creatures with 3 toughness. While not all too bad, it’s sorcery-speed removal (not a fan) and a turn late. You do basically pay for the versatility of potentially 2/3 for one’ing your opponent. Red was never really a card-drawing color but with cards like this and M14’s Academy Raider I like that they do get to quickly rifle through a few cards in search of relevant cards instead of just having to draw clumps of land, unable to end the game. Nice static ability on him that just makes the whole idea of going all in with tokens interesting (eventhough the 5-color Gods + tokens concept was more of a joke in the previous article). You get an 6/5 body for 4 with haste if you managed to get the Hammer of Purphoros in play the turn before and stick a few non-token creatures in there (or just an Ash Zealot). Here we have our godly weapon and what a potent weapon it is! Granted no one really enjoys sacrificing lands anymore, but it can be well worth it in a monored deck. Of course with a Purphoros in play it also means that your opponent will be getting hit for a free 2 damage as well. As mentionned above, you can get a hasty turn 4 6/5 creature down on turn 4. This is undoubtedly why Purphoros only has 1 Red mana in his casting cost. You ‘need’ to play a couple of dudes beforehand and keep them in play to accomplish this, but Red is anything but short on low-curve aggressive creatures. Unfortunately though, it will not trigger Purphoros’s 2 damage ability since the actual creature (the Mountain) was already in play. Still, it can seem like an interesting route to take with the deck. It’s not like Awaken the Ancient is a heavy investment money-wise. Another really nice thing to not overlook is that it produces a colorless token which may not mean much right now, but it will when you have to potentially face off with creatures who have protection from red either built-in or obtain it from another source (equipment, etc). I recall joking about Didgeridoo and Changeling creatures as a Legacy deck a few years back with some friends. One of them played the flute so we thought the deck was a perfect fit. It was obviously really bad since even Boros Reckoner was not in existence yet. Once Reckoner was released, the jokes resurfaced but didn’t last long. When the Theros block was announced it was almost a certainty that Minotaurs would be one of the tribes. Didgeridoos suddenly started creeping up in value and wether or not they will actually see real Legacy play is yet to be seen. It’s going to help break some stalemates in Draft/Sealed affairs. Other than that, it’s no Inferno Titan ( a cycle that some speculate might get reprinted this block, but I personally doubt). A nice way to represent the story of Prometheus in card form. Prometheus being the titan that shared the gift of fire that had long been kept from the humans. He was punished by the Gods by having to be consumed by a giant bird each day and having his body regenerate each night. That’s vaguely how I remember it, but hey! you can Google that stuff in these modern times. I suppose if there are enough mana dorks that are human (like Avacyn’s Pilgrim was), you can feasibly accelerate into this guy and then start pinging away with your little dudes. It seems more cute than effective. Still, the image of a bunch of little humans pitching their torches at a bigger creature and killing seems somehow appropriate. He sure as heck didn’t teach them the art of the Hadouken. Perhaps when we return to Kamigawa block, eh? I’m rather surprised that it took so long for red to get a small double striker printed. It also makes sense in this case since it’s a two-headed creature. I guess the left side bites first then the right? You can’t really expect them to coordinate their attack right? Once you get past the initial WOW! aspect of this card, you get to realize that it’s quite ordinary. These are very control-ish abilities except for your attackers having deathtouch. They couldn’t really give you unconditional deathtouch and have even your lowliest hang back and just take down big attackers. It would be somewhat wrong, wouldn’t it? You get a nice mix of ‘useful’ abilities. Snipe a flyer, pad your life total, pump a creature or recover from some milling. If there was a good shuffle effect in Standard it could pass more for a reload your deck with good stuff you’ve already used or had countered over the course of the game. If you’re thinking that this belongs in the Commander bin then I’d wager you are correct. Unless some totally over-the-top mono-green control surfaces with this and Primeval Bounty at its core, i’ll just maybe consider siding it in versus whatever mill deck may surface in Type 2. The graveyard recovery ability may have been nice if it targeted any graveyard so that it would also simmer down some potential reanimator decks, but I guess they figured Scavenging Ooze is hate enough. Will it still see play or just get lost in the shuffle? Yes, this is a real card. You get a potential 6/6 trampler (indestructible too, might I add) for 4 and potentially as early as turn 3. Ready to attack on turn 4. Of course it involves a mana dork or two and probably a certain 3/3 for 2 mana. Still, having a Primal Rage in play means your beefy creatures matter more and your attacks are not stymied by your opponent chump blocking each turn. Yes, I am fully aware it’s not quite Rancor. That’s why Rancor is in quotes. It’s close enough. Historically in Magic: the Gathering, having the biggest creature to attack with didn’t mean squat if it had no built-in form of evasion. Now green mages can dig up their mana efficient fatties because they can matter. That little number in the bottom right before the ‘/’. Yep, that one. Just tap some mana, play some dudes and Nylea then turn them sideways! Make Garruk proud (even though he’s probably not in this block). It’s an ‘upgraded’ version of Commune with Nature. I imagine this will get some play seeing as how the gods are enchantments and well, so is almost everything else. You get to ‘dig’ five deep and hit a relevant creature, enchantment, legendary artifact enchantment or God. Not too shabby. Also going through what might have been a small clump of lands is a bonus (pseudo-Scry). A nice way to give green more card draw without actually being straight-up card drawing (aka. Harmonize). Very interesting take on sideboard cards. If anything it might help create more diversity amongst the Tier 1 decks since you can avoid the mirror-match hate. Or, it may just do the opposite and give you tools to break the mirrors. I’m very curious to see what the outcome will be or even if this is part of a cycle. What would the others be called? I know, I know. Pretty unoriginal card names there, I’m sure the real card names are much better. I heard some people comparing this to Elvish Archdruid and it seems about right. Elves are really not part of Greek Mythology so they had to get the other ‘mana dork’ tribe: humans (druids too, but that’s more like their ‘job’). Still, this guys can potentially gives us a more stable mana supply if we plop down early enchantments and cast primeval bounty or some other expensive card much earlier. It allows us to not have to try and play around something like Supreme Verdict. Then again, with creatures like Nylea we may not need to. Also, contrary to Elvish Archdruid, he makes a mean blocker. I know this isn’t the most exciting feature that comes to mind when evaluating a new Magic: the Gathering card, but it’s surely something to consider in a Standard format that becomes increasingly more about creatures. Does this mean we will get to see a certain card from Future Sight? Mana dorks and creature spam is heavily encouraged in this block. While I’m not a big fan of that unless Elves are involved, it may be worth trying out. Remember that there are still about 150+ cards to be spoiled/previewed, so hang in there. Still, the later you hold off casting this, the less damage you are potentially dealing. The earlier you drop this, the smaller it ends up being. Nothing exciting about casting it on turn 2, or is there? It can basically be your Kalonian Tusker # 5-8. Of course it just becomes awesome when you cast it after a Kalonian Tusker has entered the battlefield. It also interacts favourably with another Kalonian: Kalonian Hydra! I can’t believe I almost completely dismissed this cards as a bad Birds of Paradise rip-off. I literally blazed through the rules text and totally forgot it had hexproof. Normally I am not a fan of the ability as it takes away a lot of the game’s interaction as we saw with the bant Hexproof not too long ago. In this case though, hexproof is pretty well implemented. It somewhat makes this into another Darksteel Ingot in the sense that it tends to remain on the battlefield longer. I went from being disappointed that this was the Buy-a-Box promo card to being pretty excited about it. Sure, they could have reprinted Rampant Growth or something, but this is far more nice. It’s a permanent that accelerates us and counts towards our ‘Devotion to Green’. Will it be played alongside Mana Bloom so that you can have 8 cards in your deck that accelerate you on Turn 2? I think there is a good chance of that with enchantments mattering and Mana Bloom being an enchantment. Are we about to see the second coming of Geist of Saint Traft? If the name sounds familiar to you, it’s because it is. He was a character in 300 (the movie). I’m unsure if there is a relation there, but I just recall hearing that name before. I’ve read and heard many comparisons to other cards. Geist of Saint Traft, Nightveil Specter and Augury Adept. I believe that they are all very appropriate and am personally very glad that this card is not a Mythic. You have the pseudo evasion of Nightveil Specter, the stats and mana cost of Geist of Saint Traft and then the combined ‘when combat damage is dealt’ ability of Augury Adept and Nightveil Specter (sort of). You even get the added bonus of casting the card with mana of the colors you do not even have in play. I doubt the power level of the card is anywhere near Geist of Saint Traft’s, since he dies to almost all the removal availalble in Standard. You get some ‘random’ but interesting benefits which are more suited to something like Commander. He also circumvents the ruling about only being able to produce mana of your general’s ‘color identity’ (at least it seems that way, I’ll have to get some kind of confirmation on that). Anybody have a clear answer? We’ll continue with more Previews tomorrow. The set is shaping up really nicely thus far!